If fashion is a way to express individuality, what does it mean to dress in order to be like-able? What does it say about a person if they tailor their wardrobe to fit a standard of likability, and what does that standard say about society in and of itself? These are all particularly loaded questions, but all always seem to emerge within discussions of public figures and the wardrobes they choose to wear. There's a constant emphasis on wearing what makes you feel great, feel the most confident, the most comfortable — and that's the way it should be. Self-empowerment, that is what fashion is for. But then there's the idea of dressing for what you want, and frustratingly enough, sometimes that means dressing to be liked, or at the very least, perceived as likable. It feels uncomfortable to even just type that, as it goes against pretty much every message of self-empowerment ever. It's good to be weird, we should all try to stay weird; moreover, the idea still stands that you should never judge a book by its cover, right? It's a hard truth, however, that a standard of dressing likable, particularly in the workplace, most certainly exists, especially for women. "What we do see [in the Pew Study] is that women need to be likable to be viewed as qualified, and those two are inextricably linked. If you aren't seen as likable, then you won't be seen as qualified, and vice-versa. But for men, those two qualities aren't linked at all." And in fact, one quick look at the Pew Research study readily reinforces such a statement. According to the study, 65 percent of adults (both male and female) polled say that "being compassionate" is a trait more important to women leaders' professional success than for their male counterparts. And dressing a certain way is undeniably a part of this. So then what does it mean to dress "likable?" Politics aside, perhaps the phenomenon is best explained through the political career of former Secretary of State and likely 2016 Presidential candidate Hillary Clinton. Indeed, it was in a 2008 Democratic debate when then Senator Barack Obama memorably labeled Clinton "likable enough," and it has been throughout Clinton's possible 2016 campaign run where the most talk of being "likable" can be heard. Far more so than any other potential 2016 candidate (or at least any candidate thus far), Clinton has incited the most conversation as to whether or not she is "likable." Reinforcing the findings of the Pew Study, the idea that Clinton needs to focus far more on being perceived as "likable" by the public is certainly frustrating but unfortunately not all that surprising. As such, the focus on the role her wardrobe and overall appearance plays in this also comes with little shock (although it certainly does not make it any less annoying). Take, for example, a recent New York Times article stressing the importance of Clinton's amicable image in the upcoming Presidential race. "Back [in 2008], Mrs. Clinton’s advisers argued she should emphasize strength and experience, rather than her softer side, a strategic decision that Ann Lewis, a senior adviser in that race, has called the 'biggest missed opportunity' in the failed 2008 primary contest against Barack Obama. Now, after two decades in the public eye, Mrs. Clinton must try to show voters a self-effacing, warm and funny side that her friends say reflects who she really is." There's no explicit mention of Clinton's attire, but the intention is there, for wardrobe undoubtedly plays an important part in whether or not one is perceived as "warm" or "soft." Moreover, the article continues on to cite the importance of wardrobe during Michelle Obama's tenure as First Lady, how consistently wearing pieces from J. Crew and Talbots helped firmly establish her as a relatable, likable public figure. Certainly, for all the accolades Clinton receives thanks to her unapologetic choice to sport tailored pantsuits and shorter hair, there comes a sort of underlying almost-mockery of it all, along the lines of, "Oh, there's Hillary Clinton in her pantsuit... again!" It's as though a woman wearing pants is something still something out of the ordinary, something that is somehow still perceived to shatter gender roles in a way that makes a woman too harsh, too serious, too unlikable. Which, of course, is absurd. It's 2015. It shouldn't be shocking for a woman to wear pants. Women shouldn't have to worry more than men about being perceived as likable, and if it is still a necessary evil, then wearing pants shouldn't automatically imply that a woman is unlikeable. For such thinking only reinforces the idea that a woman in charge — a woman who doesn't adhere to traditional ideas of femininity — is automatically unlikeable and therefore not suitable for the job, whatever it may be. It's just as frustrating to acknowledge the role wardrobe plays in making women likable as it is to recognize that likability plays such an important part in a professional woman's success. Yes, Hillary Clinton wears pantsuits, but focus should be put on her career as Senator of New York, Secretary of State, her degrees from Wellesley and Yale. 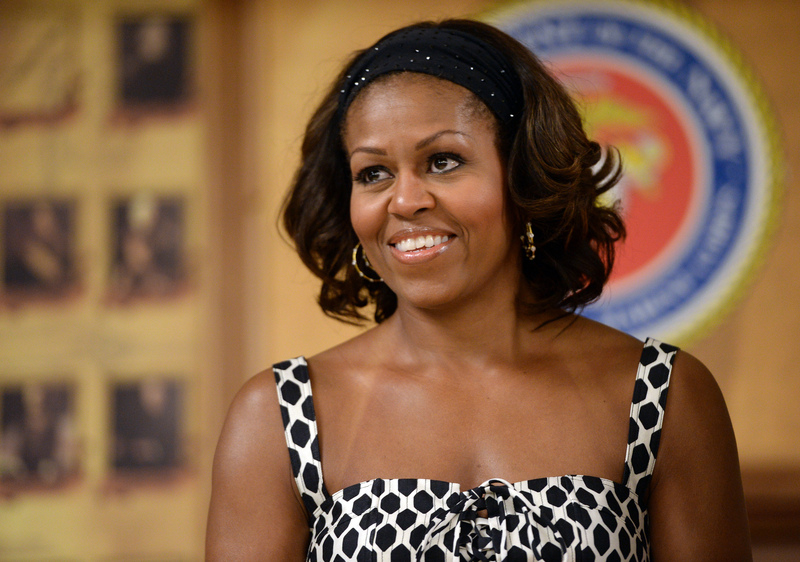 And yes, Michelle Obama's killer wardrobe undeniably aides in making her someone more appealing, but the focus should be on the success of her Let's Move campaign, on her push for healthier school lunches, on her degrees from Princeton and Harvard. It's a reality that needs to change and will only change if women are no longer judged on the undeniably ridiculous standard of likability.